The Middle Fork of the Snoqualmie River extends upstream forty miles from North Bend, Washington. Downstream, it ends in Three Forks Park where the North, Middle and South forks combine and flow over Snoqualmie Falls, eventually joining the Skykomish River at the great confluence and jointly becoming the Snohomish. The Middle Fork watershed is the largest of the three forks of the Snoqualmie and includes the wildest lands and most outstanding scenery. By contrast, the North Fork is still heavily logged, and I-90 makes the South Fork the so-called “main street” of the Cascades. Unlike nearly all other low elevation Cascade valleys, the Middle Fork has had no significant development. It’s now nearly all public land and one could say it was “saved by logging” from a potentially worse fate, and the trees are growing back. The upper reaches of the Middle Fork valley are within the Alpine Lakes Wilderness area, including impressive stands of old growth forests, pristine alpine lakes, and challenging summits. The valley is experiencing the biggest change since the cleanup and rehabilitation in the 90s. By the summer of 2017 the Middle Fork road will be paved as far as the campground just before the Taylor River crossing. In general, the road is closed weekdays April through October during construction years 2014 through 2017. 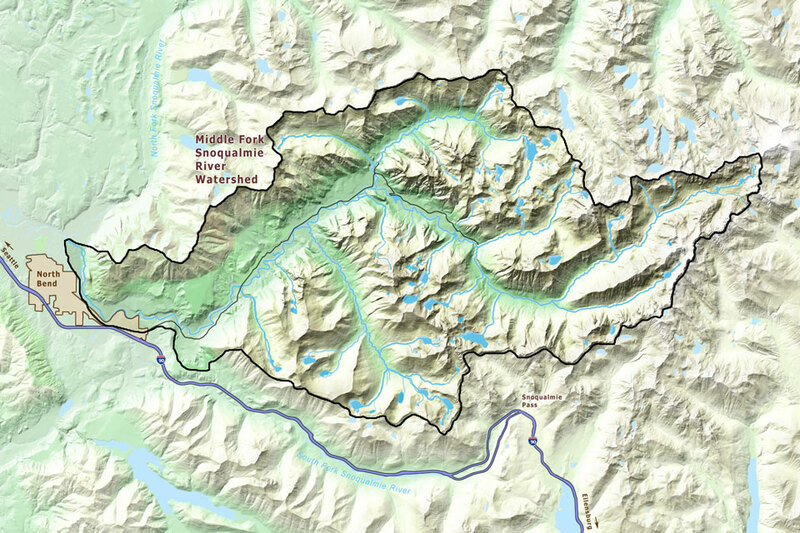 Use this map to explore the Middle Fork. Hover to see the areas, or click on one of the area links below the map. Gateway Peaks – Home of the very popular Big and Little Si hikes, and Mailbox Peak. Green Mountain – A less visited area with two peaks that were logged all the way to the ridge line but are slowly recovering. Bessemer Mountain – Bessemer and Quartz are two difficult peaks in this area, and Paperboy waits at the head of the Quartz Creek valley. Granite Lakes – A popular winter snowshoe area. Includes hikes from I-90 Exit 38 to Dirty Harry and Web Peaks. Pratt River – The most recent addition to the Alpine Lakes Wilderness area. I-90 – Easy to access lakes and peaks from I-90 trailheads.